From early September 2018, a new edition of the Master course in Entrepreneurship & Innovation in Emerging Economies (MST55806) will start at Wageningen University & Research. The course is open to all Wageningen students, it is part of the Wageningen Mastertrack in Entrepreneurship and also anyone outside Wageningen can apply to join the course if they can attend in person during the months of September and October. What are the positive aspects of this course? Among other there was no exam, this made sense in this course. In stead of demotivating students like maybe feared sometime, here it provided increasing sense of passion and ownership in the entire group. That was really great! Also I felt really positively challenged in this course. Challenging, stimulating, practical application, well-prepared professors able to share clearly their knowledge. Nice lecturers, good guest lectures and a nice project to work on! The strong point of the course is the interdisciplinarity. It doesn't matter from which Msc programme you come from, each lecture builds up your knowledge and skills to create and shape your own business case study. The weekly assignments and the given feedback by the lecturers were also a major feature of the course. The tutorials on friday in which it was possible to learn about different new ventures and what these could mean for your new venture. Furthermore, the examination of this course, it is more relevant to APPLY the information during the course. Instead of learning articles by heart. How can this course be improved? I really appreciate how there were different lecturers that could give different perspectives and help in each 'topic', but sometimes the given feedback from some lecturers were controversial between each other. That lead to some misunderstandings and unclear thoughts for students. Indeed, there has not been any aspect that I would change from the course. This course can be improved by having more moments during the seminars for brainstorming about your own new venture. 1. The atmosphere in the course was special, this might be lost if the amount of participants is upscaled to much! 2. The excursion in the course to the Food Nexus challenge was very special too and provided a great learning ground for competence development. I would highly recommend this course to anyone interested in 'Entrepreneurship'. Also students coming from other courses. I would actually like to attend a 'follow-up' course to delve more into the topic. Finally, the students involved in the course have the chance to engage in research projects, internships, theses and all sorts of events and extra-curricular activities that we share and promote in our social media community page. Course lecturers Thomas Lans, Valentina Materia, Paul Ingenbleek and me look forward to work with you and your peers on the ideation, development or re-organization of your ventures in emerging economies! If you have any question on the course and on enrolment, feel free to contact me or any of the other lecturers. Are you developing, implementing or wrapping up a PhD-level, Master of Science (MSc)-level or similar research on business models and entrepreneurship in emerging economies or rural development contexts? Dr. Thomas Lans, Dr. Valentina Materia and me are organising three discussion & tutorial sessions that may add depth to your investigations. The course provides an introduction to key theories and methods of entrepreneurship and their applications in emerging economies. The key question of the course will entail: why, when and how actors (e.g., farmers, founders of new ventures, business managers or leaders in public or non-governmental organizations) recombine resources (such as technologies, knowledge or other forms of capital) innovatively to seize opportunities or mitigate risks in the unstable, turbulent and dynamic context of emerging economies? To best support students from multiple scientific backgrounds in their PhD or MSc research proposal or thesis development, the focus of the lectures will be on three levels of analysis: individual, organisational/community, and institutional level. PhD students and research-oriented MSc students at any stage of advancement of their thesis/dissertation: proposal, research design, data collection, data analysis or interpretation of findings. Also practitioners, activists and action researchers operating outside Wageningen University and interested to build a deeper or more nuanced frame to their investigations are welcome. Approximately, minimum 8 and maximum 25 participants will be allowed to participate. The Management Studies Group at Wageningen University seeks expressions of interests for a four-year fellowship for a PhD position. 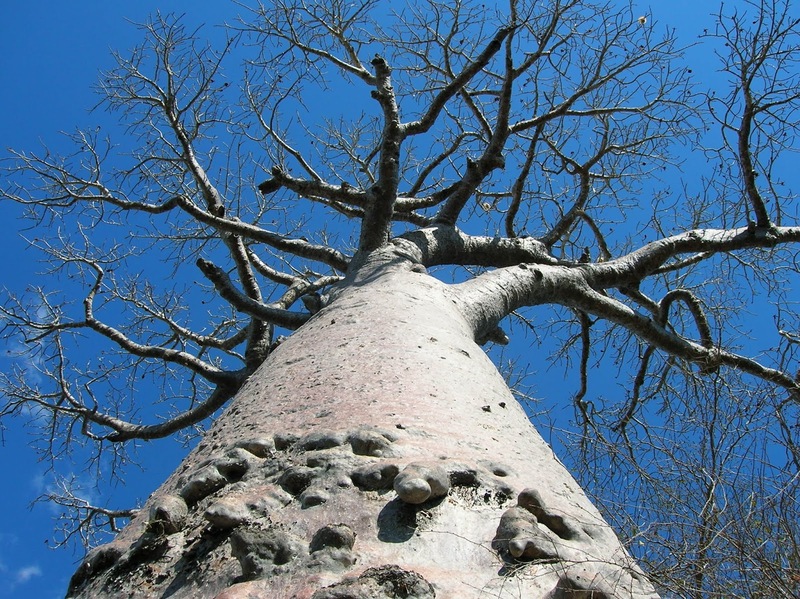 The PhD will contribute to the project in collaboration with ICRAF, LUANAR (Malawi), VUNA (South Africa) and Zimbabwe Super Seeds (Zimbabwe); and funded by NWO (Dutch national research institute) in cooperation with CGIAR Research Program on Climate Change, Agriculture and Food Security (CCAFS). Based primarily in Malawi during the data collection (with possibility to expand it to Zimbabwe), the PhD student will design and conduct research to understand the organization of business models that/to provide incentives for implementing climate-smart agriculture practices (e.g., selection and adoption of more drought-resistant seeds) and their role in influencing smallholder resilience. The latter will be assessed in terms of entrepreneurial competencies and embeddedness in value networks (see figure below). · Analyze how smallholder farmers develop their competencies and build their networks over time through the business models they are situated in. · Develop an assessment of farmers’ and farmer-based group’s entrepreneurial attitudes, intentions and behaviors on the basis of the notions of entrepreneurship, specifically in community-based and subsistence economies. 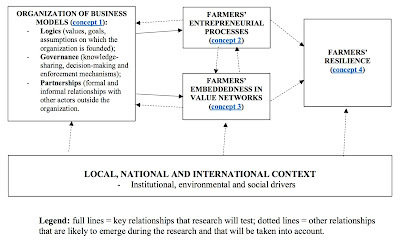 · Describe and assess the organization of business models encouraging climate-smart practices by adapting organization and innovation theories to the context of rural farming in emerging economies. · Use a diverse set of methods for data collection and analysis (e.g. interviews, surveys, participant observation, action research or focus groups), preceded by a careful research design. · Coordinate with the rest of the project team and support all project activities taking place in Malawi and, if needed, also other countries where the project operates (Mozambique, Tanzania, Zambia and Zimbabwe). · A background in business management or a related field, possibly coupled with familiarity to the context of agricultural and food value chains in Sub-Saharan Africa. · Proven excellent skills of academic writing, to be demonstrated with a recent output such as a MSc thesis or research publication where the candidate is a major contributor. · Proven ability of undertaking academic research, analytical and synthesis skills in both written and oral form. · Familiarity with conducting and coordinating research data collection in the Malawian or, more broadly, in the Sub-Saharan context. · Professionality and ability to work and communicate with an international team. · An ambition to build an academic career in a leading international research institute or university after PhD graduation. The selected applicant should be available to start the PhD program in January 2018. The fellowship will cover a monthly allowance for a total of four years, including two years in Malawi and two years in the Netherlands (i.e. what is called a “sandwich PhD” construction). The timeline of the travels between Malawi and the Netherlands will be jointly agreed depending on the needs of the funding project. Interested candidates please submit your CV, cover letter, certificate of MSc graduation with list of marks, at least one letter of reference and one or two written outputs (MSc thesis and/or publication) via email at Domenico.dentoni@wur.nl by December 14th, 2017. Together with Todd Rosenstock (ICRAF), Sera Gondwe (LUANAR), Golden Mahove (Vuna) and Wageningen University colleagues Prof. Jacques Trienekens, Dr. Valentina Materia and Dr. Thomas Lans, we received funding from the Dutch Research Institute (NWO) and CCAFS for the project "Understanding and scaling Organisational Structures of business models for SMAllholder REsilience (OSMARE). OSMARE aims to define how the organizational structures of thirteen selected business models in Malawi, Mozambique, Zambia, Zimbabwe and Tanzania stimulate smallholder resilience to market, social and environmental shocks through Climate-Smart Agriculture (CSA)-related incentives. One of these thirteen business models will be the partnership between the Malawi Milk Producer Association (MMPA) and Lilongwe Dairy Limited seeking to develop a more effective and less greenhouse gas (GHG)-intensive local value chain from dairy farms to urban consumers. 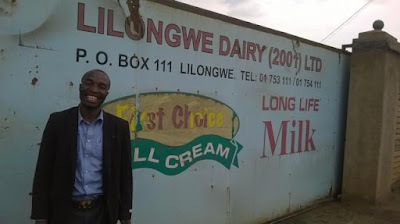 Within this case, we will investigate: does the MMPA-Lilongwe Dairy trigger dairy smallholder farmer entrepreneurship and expand their value networks over time and, ultimately, make them more resilient? How does this process unfolds over time and how it allows including women, youth and other marginalised actors in the daily farming community? 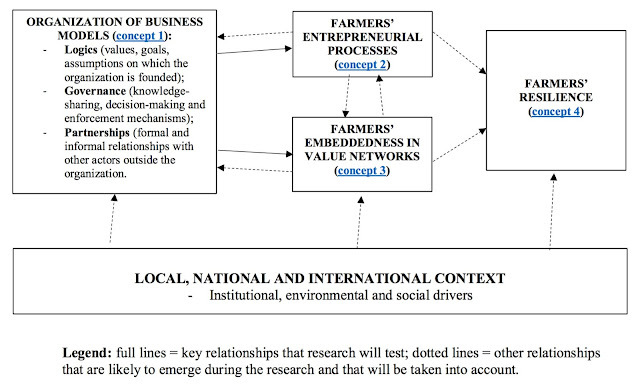 Resilience will be assessed in terms of development of farmers’ entrepreneurial processes and their embeddedness in value networks with other stakeholders in the system. During and after the investigation, personal and group trainings will provide spaces for smallholders, their representatives and stakeholders to exchange knowledge and reciprocally foster their capacities. For more information about this project, feel free to contact our newly hired postdoc scholar Drs. Rob Lubberink, who will coordinate the project implementation, or me. 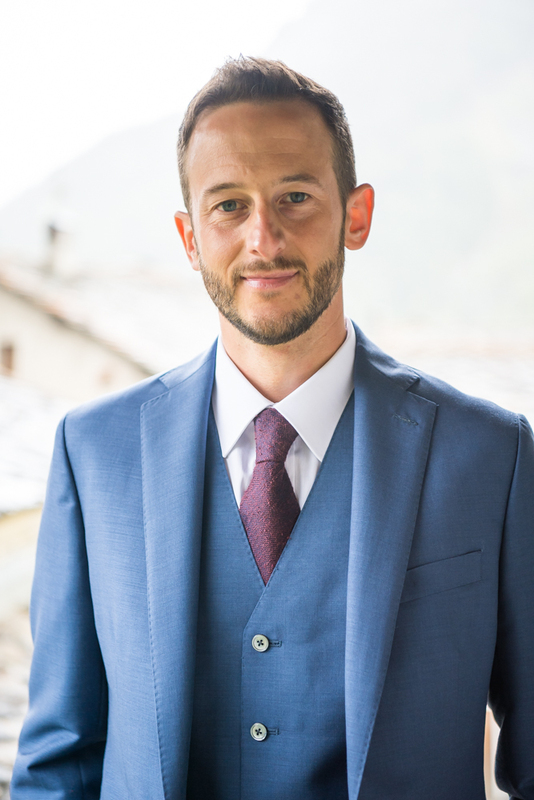 Copyright Domenico Dentoni, 2017. Simple theme. Powered by Blogger.